I bought plain Greek yogurt the other day, to the dismay of my wife. I wasn’t sure she would eat it, but then I got an email from Garbonzo’s, which got me thinking. I could use the yogurt. So I grabbed a few things last night, and then looked up some recipes for Tzatziki sauce and kind of followed them, kind of went my own way. The first thing to do is to seed a cucumber. I’d never done this, and had to look it up. I peeled a cucumber. Then I sliced them long-ways, and could see the seeds inside. And I have a seeded 1/2 cucumber. I repeated this for both cucumbers and then diced up the rest. All the ingredients, including the minced fresh garlic, went into the blender. Medium speed and then I had a sauce. I poured it into a container, and I’ll use it later. My plans are to take come of the leftover shredded chicken, add hummus, calmata olives, lettuce, and the tzatziki sauce in a pita and enjoy. Meanwhile I have a beef roast in the crock pot cooking for French Dip sandwiches for Delaney. The adventures of Ismael Wang continue. I don't remember loving Full Share when I read it last year, but perhaps I went slower this time and enjoyed the read. A few things I'd forgotten struck me, and I enjoyed my second reading of this book. I’ve had a few friends using standing desks for sometime. I first heard about Greg Gonzalez (sqlSentry | Blog | @SQLSensei), fellow runner and one of the smartest SQL people using a treadmill desk. I saw it in his office at SQLSentry a few years ago, and was intrigued, but I never tried anything. 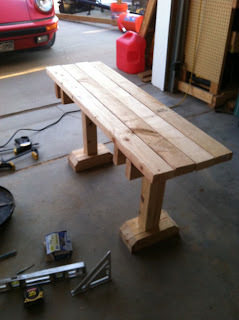 Then I saw Buck Woody (Blog | @buckwoody) build a standing desk at home, and still didn’t do anything. However a few weeks ago I ran into Buck in San Diego and we talked about it. And I decided to start. I bought a 4 monitor stand that clamps to a desk. I have been working with 2 monitors, but I had 3 set up for awhile and when I moved my desk I didn’t hook the third one back up. I’m actually tempted to add the 4th, so this was a good purchase. However I didn’t look at my desk. It has no rear lip. I tried clamping it to my wife’s desk, which backs up to mine, but it didn’t work well. The weight and torque were a little much. I was slightly stymied, but then decided that I could experiment with my desk in the basement. I use that one for podcasts, and it has a lip. So I started moving things downstairs. I started with my spare monitors. Once those were up, I shut down my desktop and dragged it downstairs, along with monitors and assorted cables. I hooked everything up and was ready to go when I remembered one thing. No Internet. We don’t have cables run downstairs, and I didn’t have a spare wireless adapter. Or did I? I “borrowed” the one my son uses for the XBOX, forcing him to deal with the built in one in the slim, which lags at times. However priorities matter, and I told him it would be a week or two and then I’d move back upstairs. No digital cables, or digital to analog adapters handy, so I’m with two monitors for now. I wasn’t sure how it would go, but I decided to just order a few DVI cables so I can actually test this well. I have 2 19” monitors on top and 2 23” ones on the bottom, but I may need to reverse things. I’ll experiment over the next week or so. I did a little minor work, including a podcast edit on this setup over the weekend, but it was like 30 minutes at a time. Today I added another box of books so the keyboard is above my elbows about an inch or so. Books are nice height adjusters for the test, so I can experiment a bit. I also raised the mouse as well, so it’s level with the keyboard. Today I’ve worked a few hours, and it’s definitely more work than sitting. I hesitated getting going this am, both because I’d be in the basement, and because I was tired, but once I got started, I actually liked it. Definitely tired, and I need to get some shoes for the afternoon to see how it works, but for now it’s a good setup. The riding lawnmower hasn’t been working, so today we drove it over to a guy in the next neighborhood that has a home business fixing small engines. I described what happened and he immediately asked me if I’d hooked up the charger wrong. I’d hooked it up to the battery in the mower and it smoked. We walked out and looked at the battery and sure enough it was hooked up backwards. He said likely there’s a fuse in there that blew and didn’t damage anything, but he did say that perhaps the starter was spinning backwards. It’s possible this will be a quick, and easy, repair. I didn’t hook up the battery. I’d pulled it out and charged it, but I certainly didn’t check that it was hooked up correctly. Hopefully we’ll have the mower back quickly. After a run today, I took it easy for a bit, watching some TV before heading out to the workshop. It was windy outside, which is just a miserable way to do anything, so I backed out the cars, made some room, and went to work on my bench. I got the top jointed and planed and then cut my braces to get them ready for the final screw together. Things are looking pretty good. After I finished Quarter Share, I started on Half Share. The books are easy to read, and fun, and I wanted to go back over them. This is a re-read from last year. 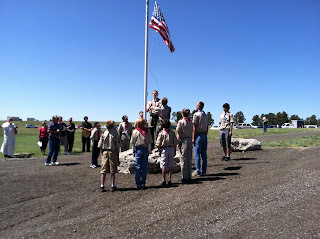 We had the Memorial Day ceremony today with the Scouts, something that Delaney and I have done for 4 years now. We got up, Delaney cooked breakfast, and we headed out. Delaney wanted the whole family, so we all went and stood outside. 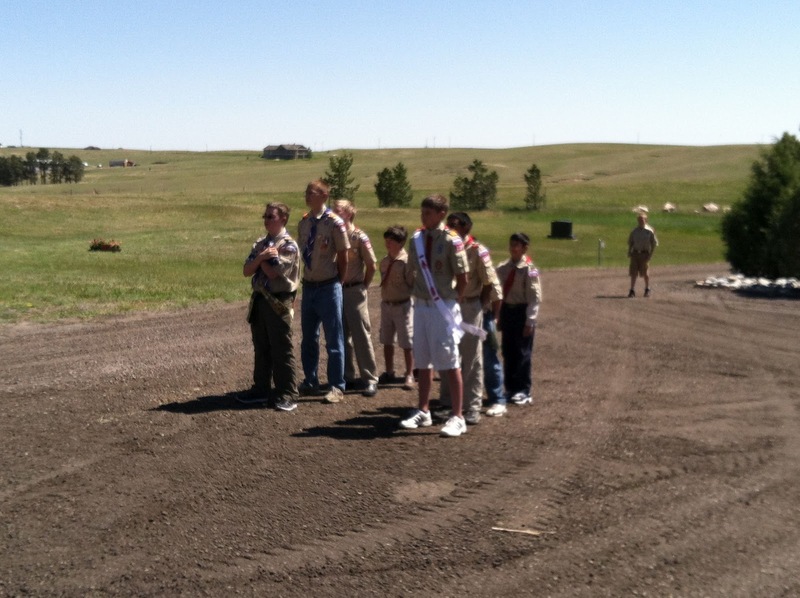 Kendall had her Girl Scout sash, but delined to line up with the boys. 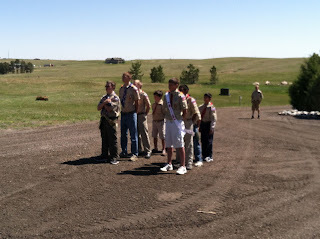 Things moved slow, but the boys stood at attention for a good 15-20 minutes while things were readied. Finally it was time. 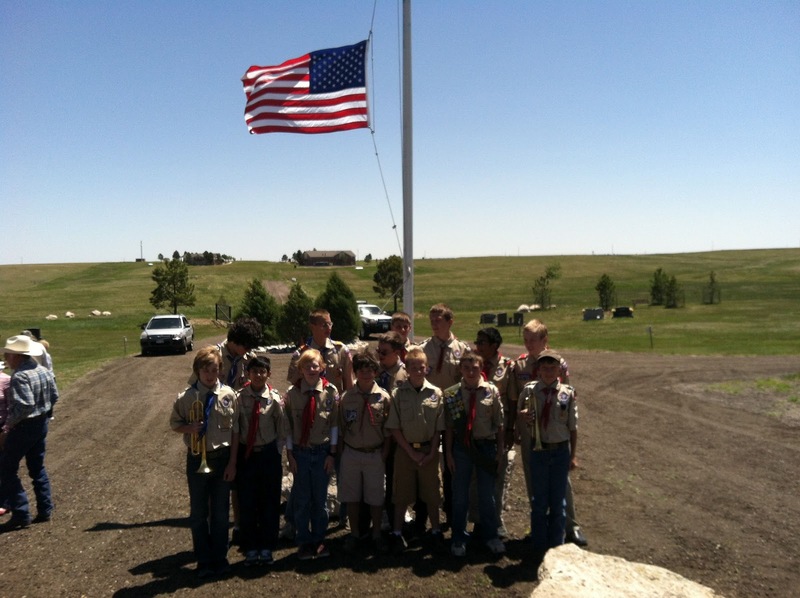 The boys marched up at the cemetary at the OLV church East of Elizabeth and presented the flag. 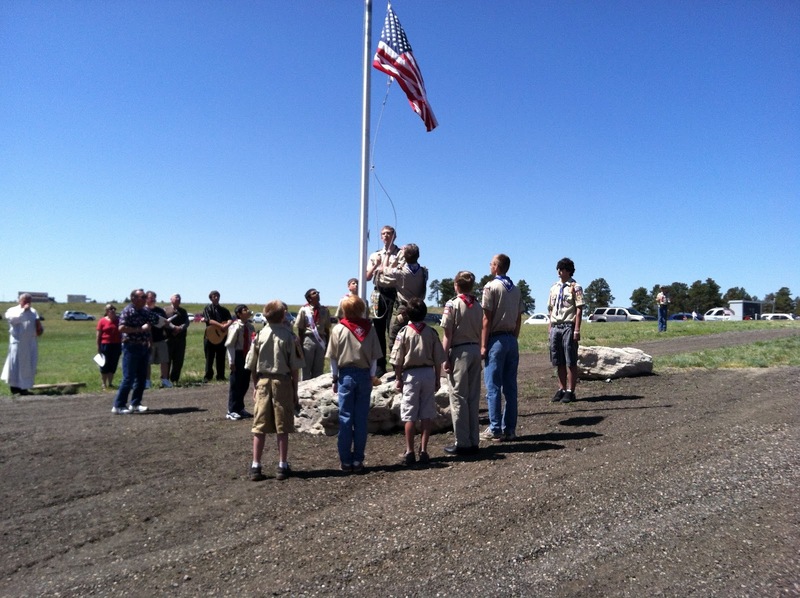 It was raised and taps played while everyone saluted. 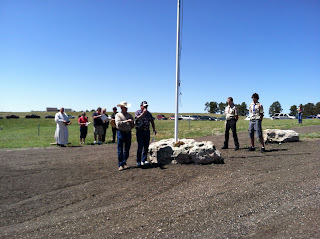 Afterwards there were a number of speeches and reminders of those who fought, and died for this country. 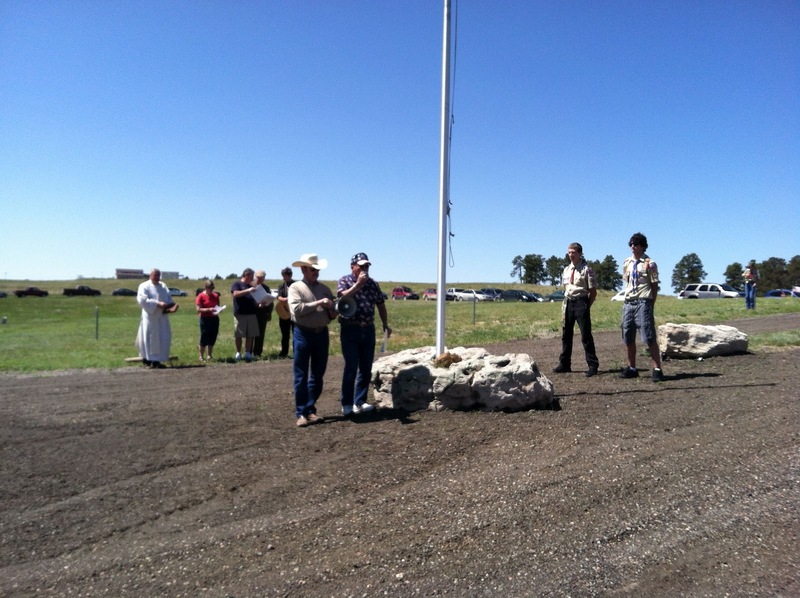 I found it quite moving, including a fiery speech by the commander of the American Legion Post 82, the sponsor of our troop. There was a reference to a John Glenn speech about having a job that was used to motivate troops before a mission in Afghanistan. Not all the men listening to the speech made it back, and they knew that would be the case. They still went. Proud of the boys, and glad they had the chance to listen to the passion of men who have served our country. 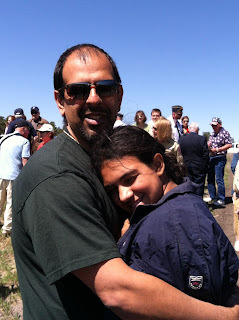 Kendall was cold, and a little bored, but she stood quietly with me and listened. 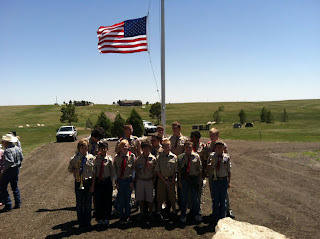 It was a good way to start our Memorial Day, and remember those that are not longer in this country to do so. 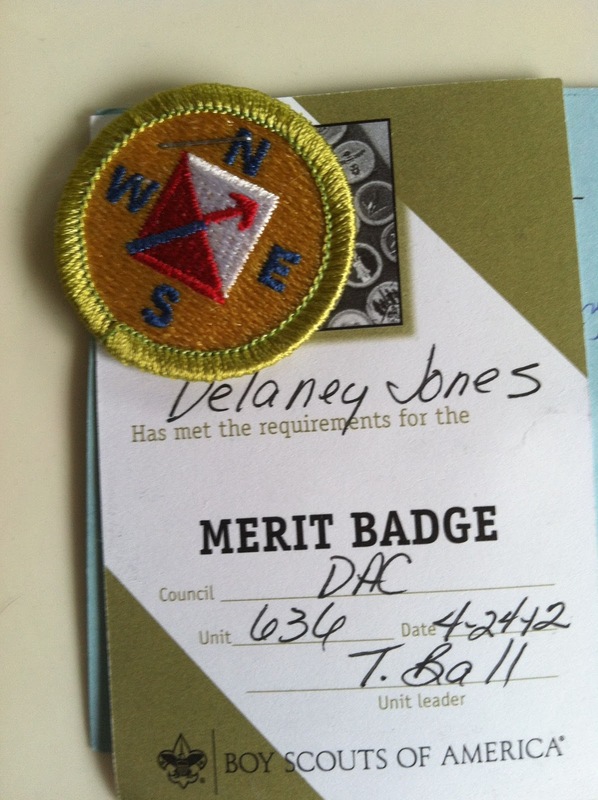 It's less than a month to Scout camp and I'm a little worried about Delaney. 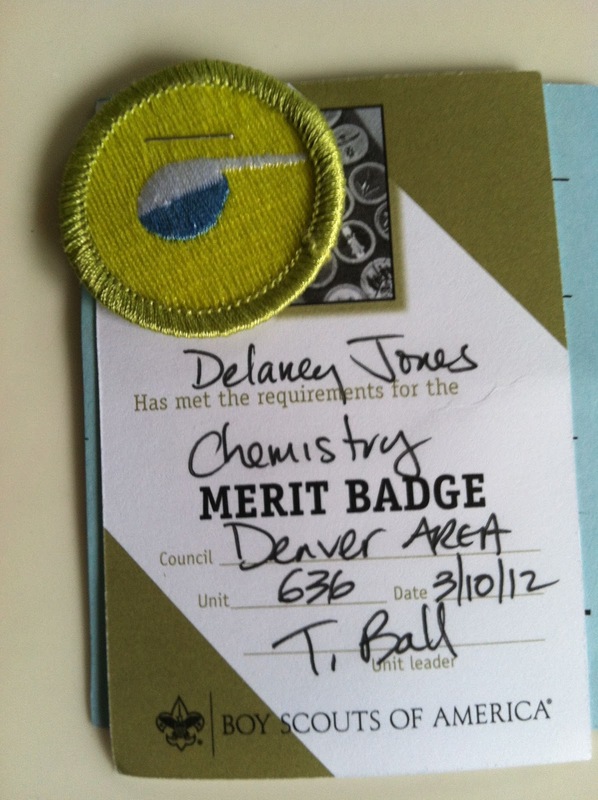 He's signed up for the swimming and lifesaving merit badges, and I am worried he's no in good enough shape. For 2 weeks I've been talking about getting him to the pool and today we went. On the way down, we perused the requirements. 150yds swimming 5 strokes was the one I was most worried about, but recovering a 10lb weight from 10ft of water was another. We got in the pool, and we went over the 5 strokes he needs working through 150 yds without too much rest. Not continuous, and he was winded, but not horribly. I think he can do this. Then we borrowed a 10lb weight from the pool lifeguards and he recovered it after a few tries and got it back to the side. We did it a second time and he managed it again. Later he couldn't do it, but he's close. One thing we need to work on, but not worry about. We also did some breath holding. I managed to get up to 1:20 from about 0:40 the first time, which impressed me. I used to be able to do 2:00, and I'll keep trying to get back there. Delaney improved from about 10s to 20s, which is good for him. I think we got him more comfortable in the water as well. Kendall did OK, but was definitely more winded. She needs more lap time and just activity time. She also recovered the brick once from 8ft, which was pretty cool. Last night was one of those quiet nights with a small group. 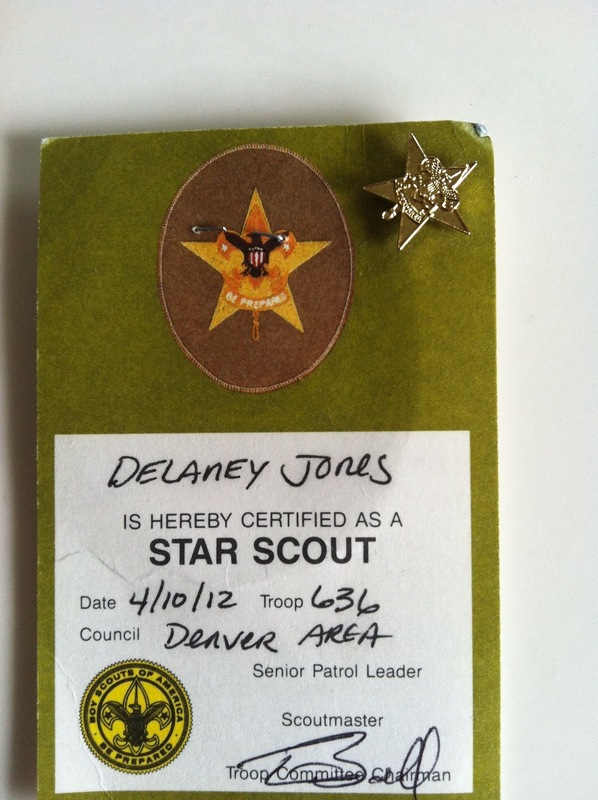 Kendall was gone all day at the Girl Scouts and then spent the night over there. It was windy, gusting well above 30-40, and we were all a little house-bound. A run for me, a bit of a walk for Tia, and an afternoon movie didn't help. I watched a little basketball as Tia walked in the evening, but we were all a little stir crazy. Delaney wanted ribs, so we decided to go get some at 8:30. We picked up some ribs, brought them home, with the plan to watch a movie at night. I had the idea to listen to a little comedy on the way home, some Jeff Foxworthy and Bill Engvall, and we continued that in the kitchen as we ate dinner. The BBQ was excellent, and we were tired when we started watching The Hulk in bed. Tia dropped off first, and me second, and I assume Delaney watched it all. I woke up at night with Delaney gone, but a large Great Dane puppy in his spot. It was a nice relaxing evening, something we don't often do. A re-read of Quarter Share, after I went through Double Share recently. 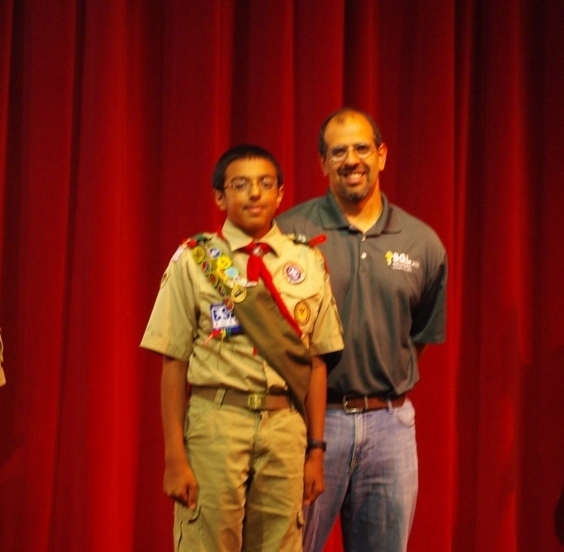 Ahh, Ismael, you have come so far. I read this piece about tax anorexia with interest. Tim O’Reilly, who I see as a “thinker” in the world today, references a blog at Reuters by Chrystia Freeland. If you look at percentages, Obama is spending less as a percentage of GDP than previous Presidents and our taxes are a lower percentage of revenue. However I, and many others, don’t care about percentage of GDP. I care about percentage of the Jones’ budget. Last year I was near the top tax rate of 35%, paying a marginal rate of 33% on the last bit of income earned here. I’m always amazed how people are confused about marginal rates (see below), but the point is I’m concerned about what I pay. That last bracket kicks in when you make $373k a year, adjusted gross, so more like $500k raw. If you make that much, good for you, and shut the hell up about your taxes. The 33$ is just over $200k AGI, or more like $300k gross on your paycheck. That’s still a ton of money. We gave the biggest tax break to the richest people, who work hard, and sell a lot of services, but I’d argue they often don’t add a lot to the country. They may increase the GDP, but often their prices are very high, or they’ve grown a lot of stock value, or they are taking advantage of government breaks in various areas to make this much money. I’m not sure they are really helping the country as a whole. So a there were two drops under George W. Bush, which I hadn’t realized. Note that the 15% used to go from $0 - $27,050 (Single filers) and the 10% became $0-$7,483 in 2002. The 15% adjusted up to $34,861, which gave a little more relief to people in the mid 5 figures of income. Interesting, if we go back to George H Bush, we had fewer brackets. 1992 saw brackets of 15%, 28%, and 31% before he had to raise taxes. In 1990 we had 15% and 28%. Arguably extremely low taxes for everyone. Rather steep rates. More payments at the lower end, capturing federal taxes from lower incomes, but very steep rates for anyone making over $88k. That’s about $185k today. A fairly high income even today. $50k back then, is about $100k now, and that would have been in the 42% bracket. Steep rates, and definitely higher than today. In the 70s, I saw more brackets, 25 at one point, but topping out at 70%. I’d definitely argue that anything above 50%, and even at 50%, that’s not fair. This is the land of opportunity, and if you do well, even with some breaks, I dislike the idea that your marginal rate might be over 50%. We ended a top rate of 77% in 1964. Before that, you could pay more than 3/4 of your income. In 1963, under Kennedy, you could have paid a top rate of 91% if you made more than $400k, with brackets going down to 75% at 100k (there were 6 brackets in between). Clearly high taxes. There were brackets of 92% in the 50s, and 94% in 1945, when WWI ended. That was a change as before that the 90% brackets were for those making millions. It lowered to 200k in ‘45. The 30s saw taxes at 78% at the top, jumping up in ‘32 (New Deal time) from a high of 25% in ‘31. Before that, in 1924 we had a top bracket of 46%, which was lowered in the second half of the 20s. The early ‘20s had brackets of 73%, which jumped in 1917, presumably to finance WWI. The oldest tax brackets in the 1913-1916 show marginal rates up to 7% only. So are taxes high? I’d argue that right now they are a little lower than average, though perhaps not too low. The highest periods of taxes seem to correspond to wars, yet with two mini-wars across the last decade, we haven’t raised taxes. The high boom periods of the early 80s and 90s seem to correspond to tax decreases, so I can understand the evidence for lower taxes. However we have had other booms, including the post WWII boom, where taxes were much, much higher. If you look at unemployment compared to GDP, there is a slight inverse correlation (high unemployment to low GDP), but not a lot. As I scan the graphs (GDP first, then unemployment) it seems as though unemployment is more cyclical and likely there are much more complex reasons for its change. Who knows. I mean seriously, who really knows? I agree with Dr. Ron Paul that for the most part the Fed, and policy makers don’t know how to manage the economy and they have limited effect. I’d argue that tax rates fall into this range as well. We don’t really know that lower taxes will result in a better country. Some people will make more money, but I’m not sure they’ll create jobs or benefit the overall country. My vote: Raise taxes slightly on AGIs above $100k. That means you are likely making in the $120-$200k/year or more. Put ALL that money towards the debt, and by all, I mean all. Reduce spending slightly, similar to the Paul Ryan budget, but reduce military expenditures as well and close all the bases overseas. Bring our troops back to the US. Fund social security, and leave the money alone. If it grows into a surplus pile, leave it. Then talk about reducing taxes, as we reduce the burdens on our future generations. I’ve seen someone making $69,500 say they paid 25% in Federal taxes. The bracket for 25% is from 69k-$137,300 for 2011, but you wouldn’t pay $17,375 (25%). You’d pay $13,500 (19.4%). The 25% is only on the $35,000 over $34,500. The amounts before that are taxed at 10% (up to $8500), 15% ($8,500-$34,500), and then 25% up to $69,500. If you’re married, the amounts change dramatically as the 15% bracket goes to $69k. One reason why marriage equality is an issue. Marginal taxes make a bigger difference when you are just over one of the brackets since you can end up paying more tax than someone making less than you. I read the confessions of a recovering Lifehacker and thought it was an interesting read. It seems that the author has started to realize that while you can make some differences in the small stuff in your life, it’s just small stuff. It’s also important not to let the organization, or hack, or change, overwhelm the benefit you get from it. I try to make some small changes here and there, and I do want to be more efficient, but not if the efficiency cost takes away too much of the rest of my life. It’s a balance, and one that can be hard to find. There’s also an interesting discussion on Hacker News about the post. I have loved the Solar Clipper series, and have anxiously looked forward to each book as it has come out. I checked recently and saw that Double Share had been released and I grabbed it right away. This one has Ismael graduating from the Merchant Academy, and his first assignment is a ship in a far galaxy. After a short trip out, where we learn a bit about his past four years, including his interest in Tai Chi, he is assigned to a ship that’s got problems. You might be able to guess how the story goes, but it’s nice to read through Ismael’s journey as he must effect change, slowly and surely, in his easy to follow way. He sets an example, and begins to change the ship to think more like he thinks. I enjoyed this, not as much as the others, but it was a nice read and I am looking forward to hearing how he moves into the Captain’s chair. I am not an American customer, and not likely to become one. I fly 40-50k miles a year, and have not always been happy with my airline of choice. I read this piece (http://www.rhrealitycheck.org/article/2012/05/22/american-airlines-rejects-female-passenger-because-political-pro-choice-t-shirt-i) with concern and a little disdain. I can certainly appreciate that American does not wish to allow offensive behavior or messages to be broadcast on the airlines, but this was not a case of that. This was a case of your employees taking matters into their own hands and unnecessarily abusing someone who has a different believe. Despite what you promote on this site (http://www.aa.com/i18n/aboutUs/diversityInclusion/diversityStatement.jsp), you are not acting in a respectful or tolerant manner. I have enjoyed spending most of my days with the love of my life, Tia Jones, and look forward to the next 14 years. First time in a long time that I dropped Delaney off at tennis and went to town without a karate class. I did drop by to say good-bye to a few people and confirm my contract was cancelled, but then I wandered over to the trail running through town, laced up some shoes, and went for a run. It was warm, but not too warm, and cool in the dips, reminding me of running back in Highlands Ranch when we first moved to Denver. A nice 2.8mi run/jog along the stream tonight before going to pick up Delaney and stretching a bit. Sad that karate is done, glad I have an invitation to come back sometimes, and ready to move on. Slightly worried I'll get a little heavy this summer, and my idea is to start a little more regular weight lifting and try to help Delaney get into shape for the fall. I went to buy The Girl Who Kicked the Hornet’s Nest at a store and they were out of them. Since I have the others in paper, I wanted this one in paper as well. Every time I went to get groceries or were near a bookstore I checked and within a week I had a copy. I dove in, anxiously, having read the first chapter at the end of the previous book. This one starts where the last one ends, with Lisbeth coming into the hospital after being shot multiple times. They work on her and she slowly starts to recover. Zalachecko is in the room down the hall from her, recovering as well. Meanwhile Blomkvist is arrested back at the farmhouse. If you’re lost at this point, stop, put down the book, and buy the Girl Who Played with Fire. The book mostly deal’s with Lisbeth’s impending trial and the investigation. This book is almost a continuation of the previous book, though more and more people are under the impression that Lisbeth is innocent. Much of this book deals with the uncovering of the whole story, one that affects a secret division within the Swedish police that investigated and allowed Zalachecko to live in Sweden. It’s long, tedious in places, but also exciting. Blomkvist and Lisbeth have almost no contact, but it’s a fascinating story that has an exciting trial conclusion. I couldn’t put this down, and raced through the 600 pages in 2-3 days. A great conclusion. Tired, stiff, and sore after 7 innings of shortstop yesterday. More movement than I’m used to, and I’m feeling it today. Getting close. It's about ready to unscrew and then stain, but I think it's a bit tall, so before I do that, I'll probably cut it a little lower. An afternoon game today, a new field, with some overcast clouds and rain threatening. We were thinking we might only have 9, so I was getting mentally prepared to play and hit a bunch. We ended up with 11, and had a good game of 7 innings. I was elected to shortstop, with our other two guys that play there not coming. I was a little nervous, and worried about the range, however it ended up being OK. I got a couple of pop flies near second, including one about 15 ft back. Missed another one that caught me turned the wrong way and I ended up backing up and not getting to it. I got another one behind third. On the ground I fielded one clean, and then bounced it to first, missing the runner. I got to another one, but it hopped slightly slower than I expected and it popped out of my hand when I went to grab it. Another scorcher went below a dive near third. All in all, not a bad game, and not worse than our other third baseman. At the place, 0-4, but I did see and hit the ball well. Got fooled on a curve and grounded to second. A grounder to third and a fielder's choice to get one, a pop out to right after I crushed one foul and then a strike out, poor swings at an outside pitch. Overall, a good game, and one I enjoyed. I wished I would have had better contact, but glad I did hit the ball a bit. On the way back from lunch, we stopped by the mailbox. There was an Amazon package for Kendall, which she got excited about and was trying to open as we went down the road. She opened it to find a new iPod Touch from Grandma for her birthday. We got a squeal of excitement, a fist pump and she told me she was iWow’d by the gift. As soon as I finished with The Girl with the Dragon Tattoo, I grabbed The Girl who Played with Fire on my next trip. The story continues and it’s one that hooked me. This story continues a year after the last book. Lisbeth has had surgery and is traveling the world with her fortune. She’s a similar girl, but not the same. She’s been out of contact, which annoys Blomkvist. Meanwhile, life goes on in Sweden, where Mikael is working with a freelancer to publish a story about the slave trade and prostitution. There are lots of plots intertwined in this one. Burman is trying to get revenge on Lisbeth, and starts a tangled web unraveling. We have the two freelance journalists killed and Blomkvist discovering the bodies. When Lisbeth’s fingerprints are on the gun, which is later found to have killed Burman, she’s on the run. The book is really a search for Lisbeth’s past among the murders. She proves as resourceful as ever, and manages to avoid the police, until a confrontation at the end with the real murderer. A shocking page turner that had my looking for Book 3 as soon as I finished this one. This day got away from me. Only Kendall to get to school, and then work, but when a friend called, wanting to chat over lunch, I decided to go. Add in shopping for Kendall’s birthday dinner, a splitting headache, and a short run and the day is shot. Now time to cook and then lay down. I’ll try again tomorrow to get something done. Once again, only Kendall went. She’s excited about a picnic with her class as they finish up elementary school. She wouldn’t miss it and packed a ball, her nintendo DS, and her old iPod (fingers crossed the battery lasts) for the trip. Lunch was a secondary consideration. 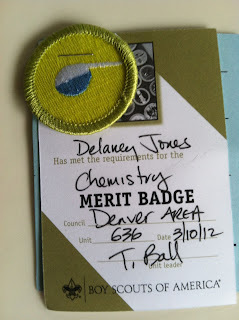 Yesterday Delaney had a field trip to Elitch Gardens and didn’t come home. He texted that he wanted to spend the night with a friend, so he’s there. I assume his friend didn’t go to school today either. Delaney doesn’t have a lot of social interest and a day playing XBOX with a couple friends is better than a day at school with all his friends. Amazing to think another school year has ended and we are not going to have an elementary school kids anymore. After having one constantly for 13 years, next year we will have a high schooler and a middle schooler. "If you hustle – all out, fully hustle – and you succeed, then you gain the satisfaction of a job well done. If you hustle and fail, you never have to worry about what might have been if you’d given everything. If you slack off, you might get lucky and still succeed, but there’s little satisfaction other than the temporary thrill of escaping with your life. If you slack off and fail, you have to live forever with not knowing what you were truly capable of." I went back to karate last night, after two weeks off. I’m about to stop, but I wanted to go back a couple times and get a little workout. A hard class, one that was a struggle at times. Boxing, fun, and I moved OK, but not as well as I’d like. I tried to stay loose, but couldn’t just get any speed. A tough class and I feel it this morning. I read this article on why Ron (and Rand) Paul have it wrong on gay marriage. I mostly agree with the point that libertarians are not succeeding because of some ideological utopian idea. I think that’s one of the problems I have with libertarianism in that it ignores the world we live in. I certainly think marriage should not be codified. We ought to be able to marry who we choose, in the ceremony of our choosing. I don’t think churches should have to marry any particular couple, and discriminatory or not, that should be their choice. We ought to be taxed as individuals, and separately. We can easily handle any deductions allowed by splitting them among the people involved. We can have joint ownership of property; we can set inheritance as we like, and it ought to be strongly advocated that we do so. We can give power of attorney for medical decisions, and we should have rights of children specified when we give birth, adopt, etc., to all those involved. But we can’t change that today. We have to “get there from here” and since marriage is codified in law, we should first start by granting those rights to all consenting adults, including polygamists. Spell out the legal obligations and responsibilities, and then work towards extracting marriage from law. It will take time, and it’s a journey, but libertarians need to present a path to follow. I’d say the same thing about health care. Employer decided health care is a mess and doomed to fail. It’s not portable and brings up all the issues of pre-existing conditions among people. We ought to be able to buy health insurance (or life insurance or car insurance or anything) and if employers want to subsidize, they can work with vouchers. The same thing with social security and other money/government issues for the most case. I don’t have a great plan for welfare, food stamps, and other safety nets, nor do I know the best way to handle education, but overall we ought to be looking for paths to get places, not unfeasible quick fixes or secular solutions. Not sure how I let the day get away from me, but it certainly did. After sleeping in and having Tia drive Delaney to school, and then having a bunch of little things occupy me at work, I was late running and still more stuff to do. Mother's Day at the ranch was without a mother. My Mom lives on the other side of the country, and Tia was out at a horse clinic all weekend, so just me and the kids today. When I went out to feed, I noticed that the barn was a mess, hay all over the floor and stuff everywhere. I wanted more coffee, so I came in after feeding and asked the kids to help me clean up the barn. They were more than willing, so we went out after breakfast. I assigned Delaney mucking duty, and he filled 3 buckets from the stalls and runs. Kendall helped me move some stuff and sweep the floors. It looked pretty good, but I've been wanting to help Tia organize inside, so I pulled out most of her tack room and went to work. I started by sweeping floors, and then planned out a bench along the back wall. We've been talking about it for a week or so and I finally had a chance to measure things and go buy wood. When I got back, I had Kendall help me assemble a few braces before she got bored. Then it was me, back and forth to the barn, measuring and then cutting wood by the house, assembling some built in benches along the back. I didn't completely finish, but I was a little unsure of what Tia will want, so I stopped and decided to let he see this and talk about how to finish things off. Kendall's last volleyball game. She didn't play with a hurt wrist, but she cheered the girls on from the sideline, and they won 2/3, finishing the season with the best record. 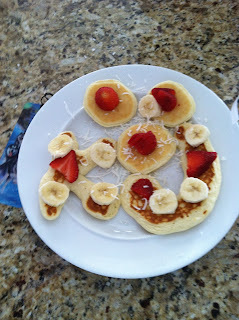 We got up a little early, and Delaney cooked us pancakes, part of his cooking merit badge work. Afterwards we had an hour to kill before her party, so we played some tennis in the cool weather, Kendall knocking balls down at the net while Delaney and I tried to volley around her. All afternoon at her party, a couple margaritas for me, lots of volleyball for fun with the kids, and some with the adults. A great time until about 4:30 or so when we left. Everyone enjoyed themselves, and I look forward to getting together with them again. We really lucked into a good group. A little park time and then the three of us out to see The Avengers again, enjoying it as much as the first time. Back home late in the rain, kids in bed, me feeding horses at 10:30pm, and then a 10:50pm run. Back in San Diego for 23 hours. I flew down last night to attend a cloud conference today. I've been wanting to learn more about how SQL in the cloud, Azure and more work and this was a good chance to get away and talk to some people for the day. Last night was quiet, a late dinner at the bar watching the nuggets win. 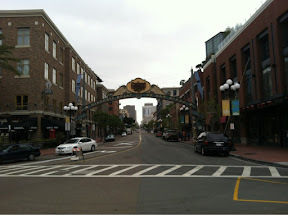 The gas lamp district downtown has changed a lot since I lived here, being renovated and rebuilt. I woke up early at 6, and headed to the boardwalk downtown. The bartender last night told me to walk through the PetCo park and take the cross walk over the trains, so I did. Just past the outfield, there's a mini park that's a dog park and you can walk through there on non-game days. A nice stadium and I hope to see a game here sometime. After a 2mi run by the water, it was off to the conference. At the ending reception I won an Xbox, so I can now challenge Delaney at home on a separate screen. Lots of building since I lived here 20 years ago but still the same beautiful weather. Sunny, warm, but not hot, and windy. A nice break and great to see the water, but this is not the place I want to live. I thought I was doing pretty good. I've been running every day, at least a mile, for 1339 days. Most days I go between 1.5-2mi, trying for around 15-20 minutes of good exercise. That gets me a little over 2-2.5hours of hard exercise a week. Apparently that's not enough. According to a recent report, most people do 2 hours a week, but they need 4. That says 75 minutes of hard exercise (which I do) and about 3 hours of lighter stuff. I think I mostly get there, with baseball, with helping Tia sometimes, with karate, volleyball, skiing, but not always. Makes me want to re-evaluate my life a bit and spend a bit more time running, and make sure I do a bit more other stuff. Both kids weren't feeling well this morning. Delaney going to bed early last night, feeling sick, and Kendall coughing throughout the night, so we had them both home, in bed, sleeping half the day and lying around. They look better now, so I'm hoping this was just a cold for each of them. Delaney woke up to find his cat missing. We were worried she was outside last night when we heard coyotes nearby and it looks like she was a victim of the circle of life. He looked around the house, outside, tears in his eyes and had a long cry on the couch. I know he's sad, and I feel bad we didn't try to track her down last night. He still has his kitten, who is getting on his nerves a bit. She's quite active and attacks fingers, toes, string, whatever moves. Not a great substitute. Kendall did a first cut at her Parelli Level 1 assessment. We realized today that we forgot one thing, but she looks good and we’re confident she’ll get her red string. I'm tired, a little worn out actually, after a busy day yesterday. It started with a 6:45am wake up for baseball. We had an early morning game on the NW side of Denver. Two cups of coffee, a delay while we raked the field and dried it out, and a great game. I played 9 innings, 1-3 with a walk, and a lot of fun, even though we lost with a walk off single. A quick lunch with a friend, a stop at AutoZone to try and diagnose a light on the Suburban (not sure I fixed it), and then home. Tia was training horses and people, and the kids were hanging out. It was a cool day, but still nice with dark clouds coming. I went for a quick run and then took the kids to play tennis. Kendall and I against Delaney for volleys and we had fun. Delaney is getting better, and you can see much better form as he practices what he's been learning at lessons. It degenerated into some silliness as the wind picked up and it got colder. We tried "small tennis" volleying softly within the serving boxes across the net, and Kendall became the "Yog" standing at the net and batting down our soft volleys when she could. We laughed a lot, even if we didn't do a lot of tennis. Afterwards we got ice cream and then came home. I started Delaney on some calisthenics to get back into better shape for Boy Scouts, for school, for life, Kendall participated as we did some push ups, sit ups, and stretches. By the time we were done, showers and bed. At least for the adults for this season. We played our second tournament match last night and lost, but did well. We had a 20-18 lead in the first game, losing 23-21 in a close one. Just a few mistakes in returning serves. Obviously something we need to work on. Our second game was 21-14, not as close, but fun. It’s been a good season, but I am ready to call it quits. My knees were aching a bit, and I think it’s just been too much activity, and too much pounding on pavement on a few weeks. So I need a break, and am going to take it easy for a few weeks. I’ve enjoyed the season, and we’ve had a lot of laughs. I hope that we play again, and I’d look forward to next season with this groups of old-timers. Kendall’s been on a pancake kick for a few weeks. I’ve gotten used to it and have been ensuring we have lots of Bisquick, milk, eggs, and various fresh fruit. Kendall likes strawberries and bananas along with coconut and powdered sugar on top. No syrup. The other day, I decided to get creative with shapes. Once those were done, I arranged and decorated them. Kendall was pleased. 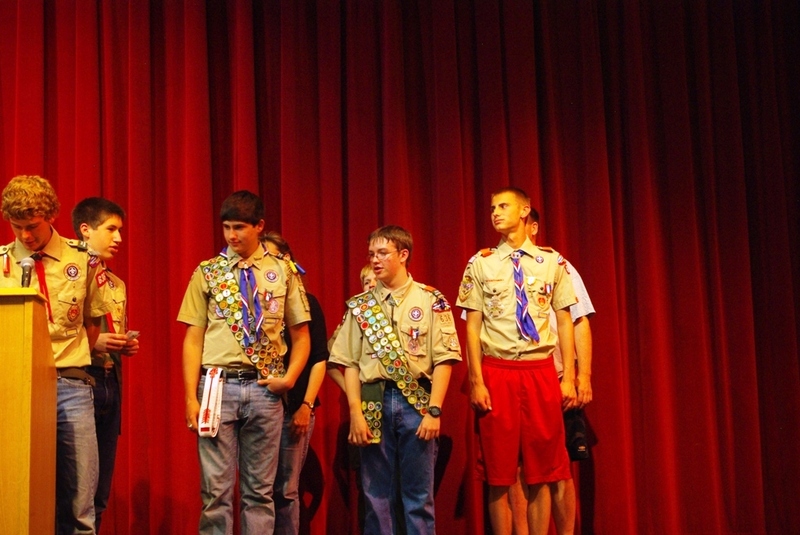 Last night was the spring Court of Honor at Boy Scouts. Running a little late this year, but a good thing. 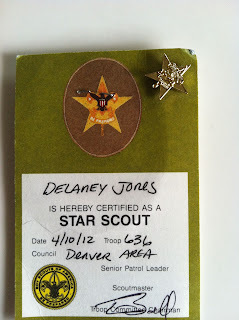 Delaney received his Star rank, and the Chemistry and Orienteering merit badges. He's moving along well, and at 13 1/2, he's well on track for Eagle Scout. And he has great role models. 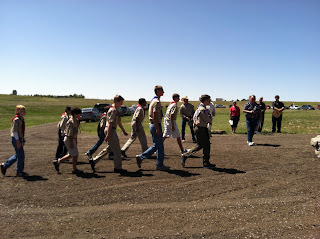 We had 4 Eagle scouts from our troop there, and we have 6 active right now out of 75 boys. An amazing percentage. 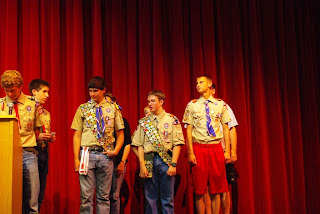 We lost two last year, but we have at least one more to be awarded this year, so it looks like we will have Eagle scouts for the foreseeable future. And we had a few of our Eagle scouts getting Palms for their rank. Trying to motivate Delaney to keep going. He's close to finishing Cooking, just needing to cook a few more meals for the family. He's also nearly done with Climbing, which we hope to finish this summer if there's a climbing day. Family Life is just started, and likely he'll pick up a leadership position in August, putting him on track to finish Life next Jan/Feb. Then it's on to Eagle.